Dc motor speed controller circuit using NE555. Are you familiar with all the applications of 555 timer circuits? If not, we can help you. We all know that for better understanding, the best source is an authenticated book on the subject. CircuitsToday presents an online store which has reviews on 3 books that are considered to be the best in providing the basics and applications of the 555 timer IC. We have reviewed them in detail. You check them out and buy them here:-Â 3 Great Books to Learn 555 Timer Circuits and Projects. 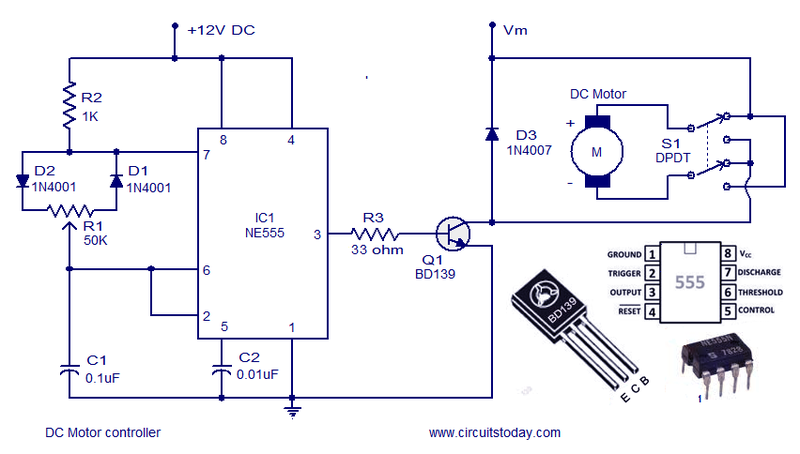 A simple DC motor controller circuit using NE555 is shown here. Many DC motor speed control circuits have been published here but this is the first one using NE555 timer IC. In addition to controlling the motors speed its direction of rotation can be also changed using this circuit. A PWM circuit based on timer NE555 is the heart of this circuit. NE555 is wired as an astable multivibrator whose duty cycle can be adjusted by varying the POT R1. The output of IC1 is coupled to the base of transistor Q1 which drives the motor according to the PWM signal available at its base. Higher the duty cycle the average voltage across motor will be high which results in higher motor speed and vice versa. Change of DC motor direction is attained using the DPDT switch S1 which on application just toggles the polarity applied to the motor. Circuit diagram of DC motor controller. The circuit can be assembled on a Vero board or PCB. Use 12V DC for powering the IC. Vm is the power supply for motor and its value depends on the motors voltage rating. Any way maximum Vceo for BD139 is 80V and so Vm should not be exceeded 80 volts. Maximum collector current BD139 can handle is 1.5A and so do not use a motor that consumes more than 1.5 amperes of current. A heat sink is necessary for BD139. @kamlesh – we dont provide PCB for your requirement now. Sorry! what are the Advantages of this method???? I used a 33 ohm resistor for the base bias resistor as per the schematic, but it got extremely hot. why ceramic capacitor is used in above circuit……. y not simple capacitor ? Hi there..!! when 12 volt is applied through battery to IC (in proteus schematic) it provides only 5v..?? why is it happening so..?? Circuit diagram of DC motor controller. I think is better, but iwant to know this cercuit can drive brush motor. Give me a reply soon. Thank you. CAN SOME ONE TELL ME. WHAT IS THE ROLE OF NE555 IN THIS CIRCUIT AND principal OF CIRCUIT IN SPEED CONTROL OF DC MOTOR. 2) by controlling field current. So far as ne555 is concerned, it is used to provide pulse as PWM technique is used. With the help of var-resistor, the pulse width is adjusted to obtain required speed. Hi A brush less motor requires an AC signal through an electronic circuit to drive it. Hence the above circuit cannot drive a brush less motor directly. hello guyz , i wanna put a brushless motor in this circuit is that possible ?? hi, i have got a dc motor 240V 13A, if i substitute the BD139 with the BUW90 NPN 250V 20A transistor, the circuits work? thank for your time and excusme for my english, but i’m italian. which ratting of motor is used? Ignore my previous question I just built it and it works perfectly on 11v dc and THANK YOU SO MUCH. Do It means, jumper between +12V DC to Vm ? If its yes, then in the diagram its shown differently? Can i use the same power supply (12v 1000mA) for the ne555 and the motor, and can i just connect one ground to ground and two + to +12 dc and Vm? Good explanation of circuit and concept. Please explain the working of induction billet heater of large capacity like more than 1000 Kw. i tried it on circuit wizard and the 33ohm resistor explode..can you pls specify the ratings of the materials used in this project?..ty.. I’m looking for a simple DC motor controller where i can change the direction of rotation very quickly to simulate a galvanometer. This schematic would be good for this but i don’t now how replace the DPDT with electronics components.